Mammoths pose a mystery to science. How did they get frozen? The answer is not as simple as you might think. Normal cold weather would not freeze them quickly enough to preserve them as well as they are found. The temperature had to drop drastically, in only a few hours, to -150° F or lower! Based on the range of places where they are found, this had to be a widespread, not just a local, phenomenon. What are mammoths? One is shown in Figure 1, an exhibit in a museum in France. Figure 2 shows the side view of a model of a mammoth. At one time, mammoths were thought to be a species that burrowed underground, like a mole, and ate earth, sometimes causing earthquakes by their burrowing! Perhaps this was because the living animal was never seen above ground, though the dead bodies were sometimes found. Anyway, we have found various mammoths in different levels of preservation, and we know enough to say they were elephant-like creatures, with tusks and a trunk. In fact, the tusks were extremely long in some cases, up to 13 feet. Their size is approximately that of a modern day elephant. Also, they had long hair, while modern elephants do not. Sometimes the flesh of mammoths has been found frozen. Often only bones are found (Figure 3 shows a mammoth skeleton). However, since some mammoths are found frozen, one question that might present itself is whether or not they lived in a cold environment. However, their environment no longer exists – it existed in the past; what method do we have to check what it was like back then? Well, we can check on the creature itself, and determine to what extent it was adapted to the cold. We might assume that mammoths lived in a cold environment, simply because they have been found frozen, and also because they were covered in hair. But let us look a little deeper, and do some investigation. There will be several pieces of evidence that the mammoth did not live in a cold environment, and that the mammoth's body is not adapted to a cold environment. First, let us look at the hair. Animals living in cold environments typically have fur, not hair, and they are able to "fluff" the hair by means of tiny muscles in their skin. This traps air in tiny pockets which insulates them from the cold. Mammoths, amazingly, lack these skin muscles! So we see that mammoth skin seems to be not too particularly adapted to the cold. Now what about the hair? True, they do have hair. Let's think, though, of other animals which have hair or fur, yet live in temperate environments. Bears are one example, which live in temperate environments. Of course, there is the polar bear, but also the black bear lives in a temperate climate. Musk oxen, wolverines, wolves, sheep are other examples. The point is that having hair alone is not proof of living in a very cold environment. Look also at other problems of living in such a cold environment. Food is one problem. Think of it - what grows during the winter? Flowers? Not much. Water is one other problem, especially if the temperature is below freezing. Elephants consume 30 to 60 gallons of water per day. The mammoth consumed much the same (based on the similarity to elephants). Where can a mammoth find water to drink, if all the water is frozen? If the mammoth "eats" the snow and / or ice, then the heat from the body of the mammoth must melt the water. This heating of frozen water would take a large part of the calories from the mammoth's food. One estimate is that half of the mammoth's daily consumption in calories would be used in melting the ice it needed for water. We also must remember the mammoth is a rather large animal, and as such, requires a rather large amount of food - and water - on a daily basis. Based on modern elephants, the mammoth would need to eat over 300 pounds of food per day. Evidence indicates over 5 million mammoths once lived in a rather small portion of Siberia - how could such a cold region supply this much food? Rather than showing mammoths suffering from starvation, evidence shows that most mammoths were fat and well fed! Perhaps the region was not so cold in the past, or perhaps the mammoths were somehow transported to the region after their death. More on this later. The stomach contents of one mammoth found near the Berezovka River in Siberia revealed much. 40 species of plants were identified, some of which grow in Mexico, and which indicate a milder climate than currently exists in Siberia. Core samples going down 100 feet into Siberian permafrost reveal a line of demarcation separating the content above this line from that below. Above this line is DNA of current modern Siberian plants, plants which today are none too plentiful and certainly not sufficient to sustain a large population of well-fed, fat animals as large as mammoths (frozen mammoths are typically fat and well-fed). Also, there is no mammoth DNA above this line. Below this line, mammoth DNA is found, along with DNA from lush, temperate vegetation which could have kept mammoths well-fed. This indicates there was a time when the climate changed, from a more temperate one to a colder one which still exists in Siberia. An elephant depends much on its trunk. If a mammoth were drinking cold water using its trunk there would be increased danger of freezing the trunk, which is already more vulnerable to the cold than the rest of the mammoth's body. This is due to the fact that the trunk has a larger ratio of surface to volume than the mammoth in general, which increases the effect of the air surrounding the trunk on its temperature. Therefore cold air would have more effect on the trunk than on the rest of the mammoth, and the trunk is not covered in hair, nor can it have a thick layer of fat (there simply isn't enough room). Elephants with injured trunks rarely survive. Thus mammoths probably would not thrive in a cold climate. 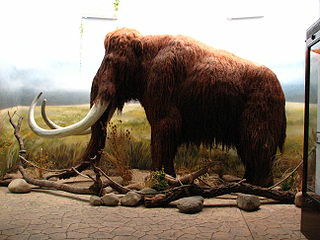 The difficulty of finding food and water in a cold environment, and the presence in mammoths' bodies of plant material which grows in temperate environments, plus the lack of adaptation of the mammoth for cold environments, together would seem to indicate the mammoth is not a creature that lived in a cold climate. Another puzzle is the requirement for rapid freezing, at a very low temperature. Vegetable material has been found in the mouth and stomach of frozen mammoths. Also, the meat of frozen mammoths has been eaten by dogs, and perhaps by humans (there are claims of people eating mammoth meat, but they seem to not be well documented). To prevent the deterioration of frozen animals, and to preserve food found in their stomachs, intestines, and/or mouths, would require sufficient cooling of the carcase. The mammoth is a large animal, and because of its size, such cooling would be slow. In fact, to accomplish the internal cooling within the estimated 10 hours necessary to preserve the animal and its food, would require a skin temperature of -150° F! Regular winter freezing of a dead animal does not seem sufficient - reindeer in Greenland fallen into crevasses are found in a putrefied condition. Some frozen mammoths are not, and this requires explaining. Well, then, how do we account for the fact that some mammoths have been found frozen in such well-preserved condition? This is the mystery. We now will examine several explanations. According to Genesis, when the Flood occurred, it did not just rain; the Bible tells that the fountains of the deep were opened. Water apparently came up from under the surface. This would imply an opening through which would the water gushed out, eroding and carrying with it much material from the crust. Even today, waterfalls, such as Niagara Falls, are known to be eroding material, even rocky material, to such an extent that Niagara Falls is measurably receding. Water from underground can reasonably be assumed to be under pressure, which would generate even more erosion. But the pressure could carry the water up high into the atmosphere, even out to where the air is thin and the temperature is cold - very cold: to space, perhaps a major component of the freezing apparatus for the mammoths! Frozen food experts have said that the temperature had to drop to 150° or about 175° F below zero, for the mammoths to be frozen in such well preserved condition. To accomplish this freezing, there would have to be a transfer of heat away from the mammoth. Cold is not a "thing" as such, but the absence of a thing - heat. This is like dark, the absence of light: dark is not a "thing" either. Heat is transferred away from an object when there is another, colder, object to absorb the heat. The transfer is in the direction away from the hotter body, to the colder body. This is like the flow of water, which flows in a certain direction: away from the higher location, to the lower location. So, we might then ask ourselves this question: What, in the environment of the frozen mammoths, existed long ago in the past, that was colder than the -150° F that was required to freeze the mammoths? This cold-source, or heat-absorber, had to exist close enough to the mammoth to be able to physically absorb the mammoth's heat, and also had to be very cold itself. Not only that, but this cold substance would exist in an area that was warm enough for plant material to grow just shortly before the freezing event - since plant material found in the mammoths' mouth and stomach was obviously growing shortly before the mammoth froze, so the food was probably growing shortly before the temperature dropped to -150° F. Not many plants grow in winter, so ... what substance could exist that would be cold enough, in a not-too-cold environment, for the freezing of the mammoth, and yet not have been there only a few hours previously (otherwise it would have prevented the existence of the temperate vegetation found in mammoth's mouths and stomachs)? This puzzle can be solved by the muddy water gushing forth at the time of the Flood. This water would have been under the pressure of the weight of the upper crust of earth, which would have forced the jetting water upward to great heights, where it cooled and then fell back to earth as muddy hail. This muddy hail accumulated and froze, creating the layer of muck found near the Arctic Ocean. One seventh of the earth's land area is covered in muck, and it has been measured to be 4,000 feet deep at some places. Where did it come from? It could have come from the muddy water that gushed from the deep at the time of the Flood. The muck, and muddy ice / hail, would not have been in the environment previous to the freezing event, since it was the result of a cataclysmic event: the Deluge, or the Flood. It only appeared AFTER the water sprang forth, bursting up into the high parts of the atmosphere, where it cooled, and then fell as muddy hail. Also, mammoths are more typically buried in muck, not in clear ice. This explains something else about the mammoths. The only cause of death that has been ascribed to any mammoth is that of suffocation. Evidence (from both mammoths and frozen rhinos) indicates blood gorging the organs of the mammoth, distended nostrils, etc. all of which indicate death by suffocation. But - how can a mammoth die by suffocation? Submerging the mammoth in water could do it, or submerging the mammoth in anything that would prevent air from reaching the creature. But, the mammoth is a big animal - what would bury a mammoth? If the water that sprang forth from the great deep was enough to cover the entire planet with water, then it would conceivably provide enough material, at least in some areas, to bury the mammoths. So, not only does this scenario explain the (otherwise inexplicable) freezing of the mammoths, it also explains their death by suffocation! It also explains one other item. One mammoth, the Berezovka one (found near the Berezovka River), has a leg bone crushed, while surrounding tissue was not damaged much. This is not a broken leg, but a crushed leg - with the mammoth in an upright position. This seems unusual, since if you apply pressure lengthwise to the ends of a yardstick or a meter stick, typically the stick will not be crushed. If the force increases, the stick will bend and beak, but not be crushed - unless there is something preventing it from bending. The mammoth is a large animal, which would require a strong leg bone; see Figure 4 illustrating the size of a mammoth leg bone. Therefore, the force required to crush, rather than just bend and break, the mammoth leg bone would have been very large. Figure 5 shows an artist's depiction of a mammoth being buried under muddy hail. To crush such a bone would require considerable force - without bending or breaking it would also imply something was preventing the leg from bending to either side. Being buried in muddy hail would provide the required material to surround the leg and prevent it from bending, while the increasing pressure form the continued accumulation of more muddy hail, which buried the mammoth under even greater depths of frozen water, increased until the pressure was sufficient to crush the leg bone - by that time, the leg could have easily been surrounded by, and totally encased in, the frozen muck which could have been compressed and compacted tightly around the animal's leg. This crushed leg therefore can be explained by the frozen waters from the Flood. Another mystery that can be explained now is the peppering of some tusks, on one side, by small particles. These millimeter-size particles can be found embedded in some tusks of mammoths. These particles are rich in nickel and iron. Also note they are typically found on one side of the tusk. Erupting flood waters from underground could have eroded these particles from earth's crust and ejected them into the air. There would be strong winds as a result of this cataclysm, which could embed the tiny particles in tusks. One significant point about this is that the particles were on a single side of the tusk. If the particles in the tusks resulted from everyday gradual processes, there would be no reason for one side of the tusk to be favored. However, if the impact of the particles with the tusks occurred only over a fairly short time, then it is easy to imagine them impacting on a single side of the tusk. If this was a fairly short-lived phenomenon, as the Flood would have been, then it is possible the mammoths did not expose both sides of their tusks to these particles, which would explain these particles in only a single side of the tusk. This would be more true if the mammoths were already partially buried by the falling muddy hail. One last puzzle is how mammoths before freezing could have lived and thrived in Arctic conditions. There is not much space for a detailed explication here, but briefly, the theory states that underground water lubricated large plates above them. (These large plates with water beneath them, are called hydroplates, and give the Hydroplate Theory its name.) The eruption of the water released pressure in certain areas, which allowed the plates to move. This movement raised large ares, including mountains, and lowered / buckled others. The resulting changes could have affected the earth's balance of the spinning earth enough to shift what had been temperate regions to more Arctic latitudes. See Dr. Brown's book for more information. Above I mentioned that the frozen mammoths were otherwise inexplicable. Let us look at other explanations, or attempts to explain them - and look at them in the light of the known data. A few brief comments will be made about each, but not total or exhaustive; for more detailed analyses of these theories, see http://creationscience.com/onlinebook/FrozenMammoths6.html and related linked pages. This is the theory that is described above, the main subject of this article. This posits drowning in a partially frozen lake, river, or bog. This theory does not explain the extremely rapid freezing, the warm climate just before the freezing, nor the crushed leg. This theory assumes some mammoths fell into ice crevasses or deep snowdrifts. This still does not explain the evidence of a warm climate, nor the extremely cold (at least -150° F) temperature. In Greenland, which is today covered with much ice, reindeer falling into crevasses are not preserved - they are found in a putrefied condition. Assumes the animal was stuck in mud, or killed by mudslides, or died and then became buried in slow mud-flows during several summer thaws. Sudden cold spells - sometimes followed by long, cold winters – froze the animal. This theory suffers from the problem of the extremely low temperature required - in fact, the mud would have provided insulation, thus requiring an even colder temperature to prevent deterioration of the mammoth flesh and stomach contents! This theory assumes flooding rivers carried mammoth carcases from temperate zones to the cold north. One problem with this theory is that mammoths have been found on higher levels, some 1,000 feet above nearby rivers. This accounts for the vegetation in the stomachs, but not for the extreme cold required for preservation. Another explanation is that Man, in hunting mammoths, pursued and pushed them north into Siberia and Alaska, where the mammoths died from harsh weather, lack of food, or the direct killing by man. Even if man pushed these animals north into Siberia and Alaska, why would a disproportionate number be buried on the higher elevations of generally flat plateaus? But, animals fleeing rising flood waters to higher ground could explain this. This theory provides no explanation for the burial of the mammoths nor the upright posture of frozen mammoths. Another unanswered question by this theory is why man would pursue mammoths into such cold climates, instead of pursuing other game. Also, this fails to explain death by suffocation, and the extremely rapid freezing. According to this theory, the Ice Age caused more ice, lower oceans, and the appearance of a land bridge in Bering strait which separated the warm Pacific Ocean from the cold Arctic Ocean; warm evaporation from the Pacific condensed over the cold Arctic and mammoths were buried in severe snow storms early one fall. As the Ice Age ended, rain washed dirt onto snow to form the material in which mammoths are found. The temperature would have been too cold, during an Ice Age, for the temperate food supply the mammoths needed and to explain their well-fed condition. The area in which mammoths are found today is not temperate, and it would have been even colder during an Ice Age, with even less food supply. Yet snow storms would not have been cold enough for the extreme cold needed for preservation, nor does this theory explain the peppering of the tusks. This theory assumes a mild Ice Age, with burial by dust in "loess." However, dust particles are rounded while loess particles are not. Even today's climate is too cold to support large numbers of well-fed large animal inside the Arctic Circle, where there would be extended periods of darkness (with drastically reduced food / vegetative growth). This theory also does not account for the -150° F temperature. According to this theory, accumulation of ice during the Ice Age unbalanced the earth and the crust slid, moving Hudson Bay from the then North Pole to its current location. This moved some temperate regions to what are now Arctic regions. This crustal displacement also resulted in release of volcanic gas high into the atmosphere, where it cooled and then fell to earth. Volcanic dust also lowered temperatures and mammoths were buried in the dust. A problem is that this would not move Alaska much north, so this is weak on explaining Alaskan mammoths. Another is that the results of such a shift ought to be found in the Southern hemisphere, too, so there ought to be frozen carcases in the Southern hemisphere. A meteorite melted frozen tundra / ice, which mammoths wandered into before it refroze, in this theory. This cannot explain how mammoths thrived in the Arctic, nor the -150° F temperature. To reiterate, none of the other proposed theories examined can explain the extreme and sudden drop in temperature to such an extreme cold (at minimum -150° F). Some theories propose burial, by snow or mudslide, and may explain the crushed bone - though this still is difficult, since this requires enormous force to not just break, but crush, the leg bone. Some theories explain a part of the puzzle, but the only theory that explains all the puzzles listed in this article is the Hydroplate one. This is really only part of a much more comprehensive theory developed by Dr. Walt Brown, known as the Hydroplate Theory. There is much more to this theory, which deals with fossil formation, the Grand Canyon, measured ages of rocks, etc. For more information on not only the frozen mammoths, but other interesting aspects of this theory, see Dr. Brown's book In the Beginning, and / or his website, http://creationscience.com .